Did you know New Jersey is one of only eleven states where the court system is required to give tobacco companies a benefit that other defendants are denied? It’s true. As part of the Master Settlement Agreement reached in 1998, New Jersey agreed to put a cap on the amount of money tobacco companies must post as bond in order to appeal adverse verdicts in exchange for money and other concessions from the 5 tobacco companies involved in the litigation. To this day, tobacco companies are the only defendants in New Jersey that get the benefit of an appeal bond cap. When a defendant loses a case at trial and the plaintiff receives a monetary award, state law typically allows the plaintiff to collect that money as soon as the trial court proceedings conclude. In many cases, however, the defendant will appeal to a higher court seeking reversal of the trial court’s determination. Under current law In New Jersey, in order to file an appeal, the defendant must post a bond for the full amount of the award while the appeal is pending. With awards now reaching hundreds of millions of dollars, it is often financially ruinous for a defendant to post such a large bond. In these cases justice takes a back seat to economics, and companies will pay instead of appealing even what they consider to be wrongly decided. Other states have realized that tobacco companies aren’t the only businesses that get hit with big verdicts, and have put caps in place for all defendants or eliminated appeal bonds altogether. The map below shows how the law varies across the country. 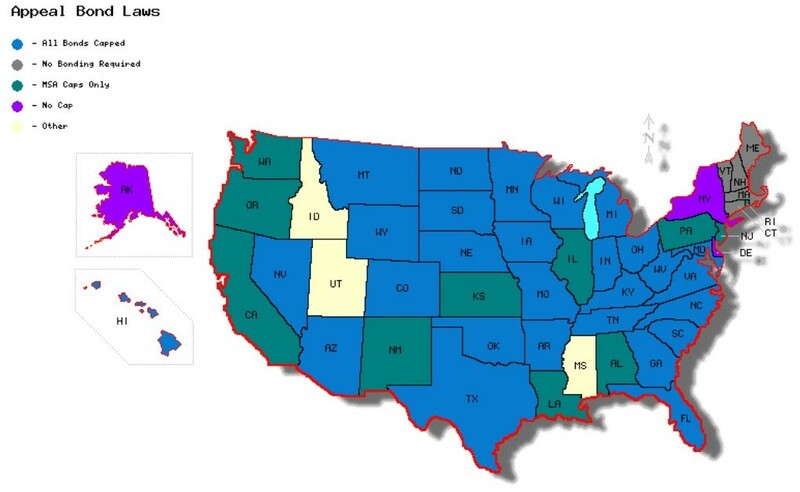 As of July 10, 2015, there are 33 states that have done away with appeal bonds or capped them for all defendants. 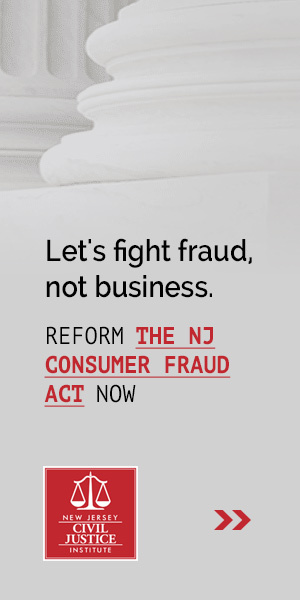 While the New Jersey legislature refuses to move legislation forward that would expand our current cap to all businesses (note how A1055/S2052 have both stalled in committee), other states continue to see the value in making sure final verdicts reflect the facts in the case rather than bond financing options. Nevada is the most recent appeal bond cap adopter. The legislature there passed SB134, which limits appeal bonds to the lesser of $50 million or the amount of the judgment. Under the new law small businesses benefit from an even lower cap, just $1 million or the amount of the judgment. In May, Maryland passed HB 164/SB301, which caps appeal bonds in that state at $100 million. There is an indication that the legislature will consider creating a lower cap for small businesses, potentially set at $1 million, in a future session. Giving all companies the ability to appeal big verdicts against them without mortgaging their future or declaring bankruptcy is good legal policy. It is time for New Jersey to recognize that tobacco cases are not the only cases where big verdicts are possible, and adopt an appeal bond cap that applies to all defendants. If you agree, we urge you to share this article with your legislators, and tell them that you think all defendants should be given the benefit of an appeal bond cap.